Omelette is proud to present this years feature Spoonbill show at Melbourne’s new premium venue; Howler. 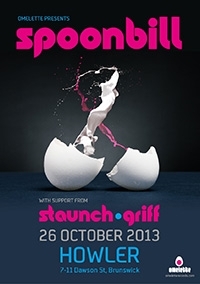 Ready to unleash a unique stage spectacle, Spoonbill is poised to craft an unforgettable amalgam of spliced groove & bass tweaks aimed at stimulating both mind and body. The stage show culminates as a sensory fiesta with live electronics, live instrumentalists, synchronized visuals and kooky theatrical performances for the full sensory barrage. Supporting on the night is the OZ glitch-hop heavyweight duo Staunch who will be returning from a US tour and primed to boost their signature glitch n bass party sound to eager ears. Also featuring on the night is Griff. The smooth groove maestro from Melbourne who crafts a delectable blend of lush melody laden with solid bass n beats. This event promises to be an exceptional night of quality groove & bass electronica from Melbourne’s cream of midtempo beat smiths. Expect a solid party shakedown, eye popping visuals and exceptional sonics in this super funky new bandroom in the heart of Australian’s underground.